Home > Mobile Phone Uses > Can You Use a Mobile as a Sat Nav? Mobile phones have become the ultimate multi-tasking devices. Not only do they make calls and send texts, they can take photos, browse the internet, play music, receive FM radio, record sounds, act as personal planners, store files and take videos. The more expensive business-targeted mobiles can also act as satellite navigation systems, capable of directing your journey in a car, or while on foot. Stand alone sat nav systems such as Tom Toms, Navmans and Garmins, come with their own map systems loaded and most now connect to the internet so that you can visit the manufacturer’s website and download the latest version of the maps. This navigation data takes a lot of collecting so, understandably, companies that make sat nav systems aren’t very keen to part with them. Mobile phones that offer navigation facilities either rely on the networks own navigation software – Blackberry maps or Nokia maps, for example – or they use the freely available Google Maps application. 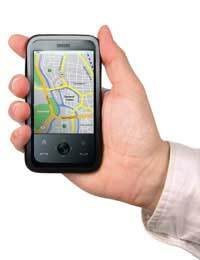 Some of the mobile phone based sat nav systems are specifically geared to people walking around cities. One of the useful applications for someone who has lots of meetings is to flag up all the coffee bars and wine bars near to an office location, so that the user can immediately suggest two or three venues as an alternative to meeting in a cramped room in the building. The app will give you directions from the office to get to the coffee bar, as well as providing detailed directions of how to find the office building from local public transport stops. The Nokia based system offers advanced route planning features which can save you some walking distance if you are on foot. If you are driving, this system is updated in real time to provide information about traffic jams due to road works or accidents, or if there is likely to be a problem due to a local event. The events information is also very detailed – so you can see what is on near to the location where you happen to be visiting. Although companies who have developed sat nav systems guard their maps quite well, some have developed mobile-based versions and these are available for sale. The Tom Tom system is regarded as being particularly good – the latest version is available for windows mobile and, once loaded up, turns your mobile into a sat nav with all the features of a Tom Tom sat nav system. This does tend to use up quite a lot of memory, so it may be worth investing in a bigger card; otherwise it could be difficult to store anything else on your phone like music or photographs. One of the most flexible systems, if you are a family or group of friends that use sat nav mobile systems sometimes, but are happy to share, is the Co Pilot software for windows mobile. This is different to other systems in the way it is loaded and stored – it is limited to a microSD card, allowing it to be moved easily between different windows mobiles. The system is updated very regularly, so that you can be sure the information is current and it even has the latest on the congestion zones in the capital, which could save you money if you drive in London to meetings but don’t know the roads that well. Vodafone also offers a flexible system that comes already loaded up on GPS phones but that is then available for a flat rate subscription of just £5 per month.